The skin, the largest human organ, acts as a barrier between the organism and the external environment for UV protection, against physical and chemical damage and microbiological attack, for the maintenance of body temperature and sensorial functions (pain temperature). However, modern style of life implies contact with large amount of chemicals in everyday products as well as over-exposition to light, mainly for leisure activities and outside workers. Those frequent exposures harm the skin, resulting in an increase of conditions such as contact and allergic dermatitis, skin photo-damage and pigmentation. Thus, new products designed to protect the skin from those contemporary afflictions are urgently needed. To do so, nanoencapsulation technology will be validated as new cosmetic ingredient, for transport and efficient release of natural active ingredients to repair the skin. 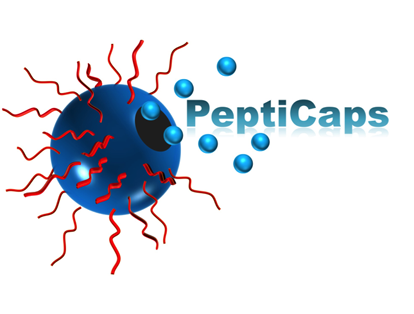 PeptiCaps aims at producing and validating a new family of stimuli-responsive nanocapsules as coosmtetic product by the authorities. The system is able to encapsulate efficiently and protect specific active ingredients for skin care application. Those nanocapsules are assembled by nanoemulsion technique using amphiphilic and biocompatible polypeptides diblock copolymers. The nanoencapsulation system allows the encapsulation of either hydrophobic or hydrophilic active ingredients. The smart encapsulation system has been specifically designed to respond to changes in pH and the presence of enzyme occurring for the skin conditions targeted to allow a triggered release of the active ingredient. Two manufacturing processes have been used for the production of the nanocapsules. One has been selected for the development of a GMP-like process. Physico-chemical properties and (eco)toxicity of the nanocapsules are being extensively characterised using techniques and protocols recommended by the EU Cosmetic regulation to establish their risk and safety assessment. Validated relevant skin models are also employing to demonstrate the benefits of the nanocapsules. CIDETEC coordinates a consortium of 5 research groups, 2 SMEs and 2 consulting agencies working jointly to validate the new nanocapsules.